"Your best friend is destined to destroy your country. And I was sent to kill her." In the world of Gaia, people have Resonance Souls. These souls grant them special powers. But some of these powers are feared. The ones of most relevance are The Prophecies, which consist of The Phoenix and The Soul Stealer. These Resonants are so strong that factions exist to try to stop them from destroying the world. In a world that believes in prophecy, do you think you can change it? The League has sent a Monte Criston to destroy The Phoenix, whose current reincarnation is in the country of Dexterity. It’s a small girl. And she’s your best friend. ConstantChaotic has not been tagged yet. Help others find ConstantChaotic by tagging it! 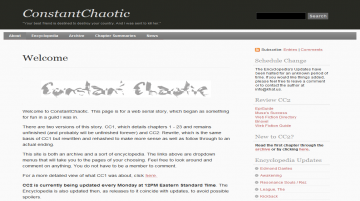 ConstantChaotic has not been reviewed yet. ConstantChaotic has not been recommended yet.